Dr. Bentley is responsible for the activities directly related to the dispensing operations of Pharmacy Health Services. These responsibilities include the overall direction, control and evaluation of services and personnel of Pharmacy Health Services in accordance with the School of Pharmacy’s vision, mission, and strategic plan, and with University policies. 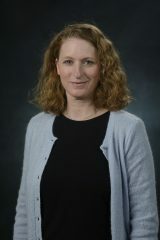 She is responsible for collaborative efforts with Employee and Student Health Services professional staff to support and foster the development of practice experiences. Her research interests include tobacco cessation and medication error prevention.